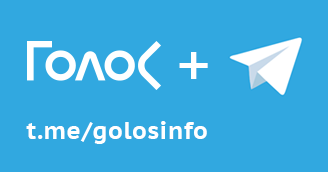 On the single election day of September 10, 2017, Golos Movement tested the new procedure of voting at the place of temporary residence. The main objective of the assessment was to find the most vulnerable spots of the new voting system in order to subsequently improve this procedure. In addition to this, participants of the experiment assessed the procedure of submitting the application and issuing the ballot, and how well the principles of public disclosure and transparency in the work of election commissions were observed. Altogether, 22 voters from 6 regions took part in the assessment. These were the Republic of Mordovia, and Krasnodar, Novgorod, Ryazan, Sverdlovsk and Tomsk Regions (appendix 1). In the course of assessment, the volunteers examined 5 different mechanisms (arrangements) of voting envisioned by the Procedure. 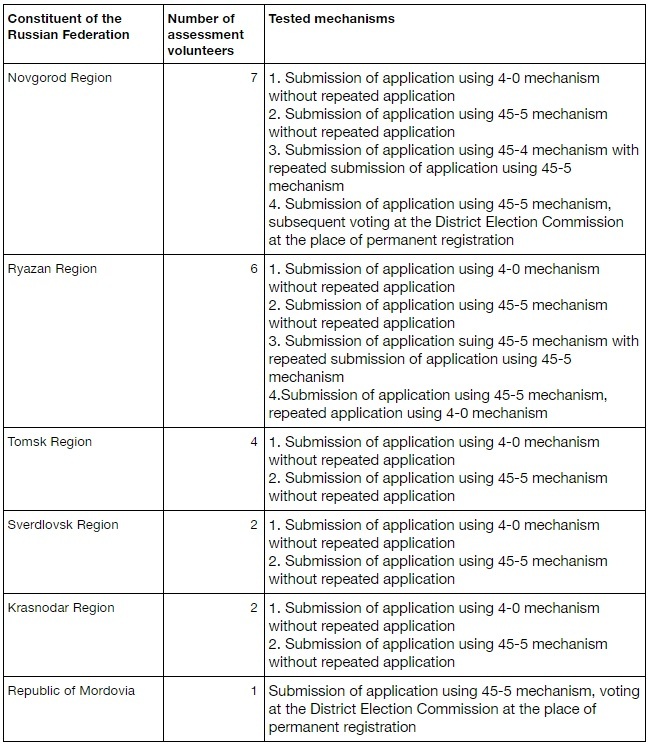 Of these, two mechanisms were arrangement 45-5 (submission of application 45-5 days prior to the election) and arrangement 4-0 (submission of a special stamped application 4-0 days prior to the election), two — the versions of the same mechanism but with submission of repeated application, and the fifth tested mechanism envisioned submission of the application 45-5 days prior to the election day, and the actual voting on September 10 in the District Election Commission (DEC) at the place of permanent registration. Utilizing the rules envisioned in the Procedure, participants of the assessment exercised their right to vote at the place of temporary residence. If the assessment’s participant submitted a repeated application, on the election day he/she first visited the polling station where they shouldn’t have been allowed to vote, and then the polling station where they had the right to receive the ballot. To analyse the practice of using the new voting system, other trusted sources of information were also used. For example, sources in the Saratov Region reported that the new voting procedure (mechanism 4-0, when special applications are submitted 4-0 days before election day) was used to organize “cruise voting” at a number of polling stations in Saratov. In the Perm Region, local administration mobilized the voters and controlled the voting using the new procedure for voting at the place of temporary residence. The report cites specific examples of shortcomings and infringing technologies that confirm that significant risks exist in extending the new system to the whole country. This is why the system of voting at the place of temporary residence requires both the revision of technology itself, and the active training of election commissions. Violations of procedure for ballot issue when the voter submits repeated application. The use of new procedure of voting at the place of temporary residence by organizations, voting for other people, and illegal issue of ballots. Violations in the process of application registration (registration of application at the election commission without necessary authority; violation of deadlines for application registration; violations of registration in the process of application submission and on the election day). The use of the new procedure for voting at the place of temporary residence for administrative mobilization of voters and controlled voting. Violation of principles of transparency and openness in the work of election commissions. Unsatisfactory preparation of the election commission members for the task of organizing voting at the place of temporary residence. The assessment revealed that the new voting mechanism has its problems. This being said, a part of these problems is related to the overall problems of our elections, such as illegal issue of ballots and violation of observers’ rights to information. Eradication of these problems demands decisive administration of justice for violations of the electoral law, and radical changes in the election commissions’ attitudes towards enforcement of this law. 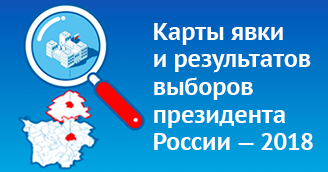 The Central Election Commission of the Russian Federation may facilitate changes by adopting a number of regulations that enable transparency and openness in the activities of election commissions. In particular, regulations regarding publication of information about the number of voters using the new voting procedure demand significant improvement. Timely publication of information about the numbers of voters who cast their ballots on the basis of applications and special stamped applications at the place of temporary residence would expand opportunities for control over the way the new procedure is used. According to item 2.8 of the “Procedure for submitting application to include the voter or referendum participant in the electoral roll at the place of temporary residence” (hereinafter, the Procedure), the voter can submit application for voting at the place of temporary residence, using the 45-5 mechanism, only once. Item 2.9 of the Procedure specifies the required actions that the members of election commissions have to take if the voter submitted two applications. According to this paragraph, the repeated application, submitted between July 26 and September 4 (i.e. using the 45-5 mechanism) should not be taken into account, and only the first application is considered valid. This restriction is necessary to avoid repeat votes. However, the process of data exchange between the election commissions is such that repeat vote after submitting repeated application is possible and quite easy to carry out. In the course of assessing the new system at Ryazan Region, the participant tested the 45-5 mechanism with repeated application submission using the same 45-5 mechanism. The participant filed both applications throught the Multifunctional Centers of the city of Ryazan. On the election day, the participant first went to the polling station whose number was specified in the second application (DEC № 1012). 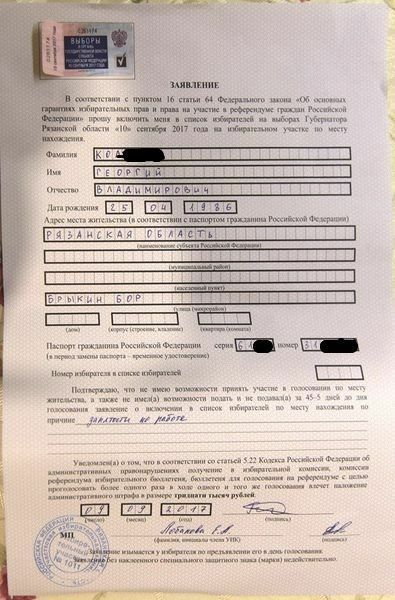 The publicly available extract from the Registry of voters who submitted applications to vote at the place of temporary residence included her information, and the member of election commission № 1012, after checking the detachable slip and passport, de facto issued her a ballot (made an entry on the issue of ballot and asked the voter to sign). Following that, a media representative that was present at the polling station announced that such action violates the Procedure. The participant of assessment tried to document the fact of violation of the Procedure in a written statement to the commission, but members of the commission refused her and redirected her to the ranking commission. In the senior Territorial Election Commission, the participant was also refused in her desire to document the fact of Procedure violation. Following that, the controller went to the polling station № 1011, which she specified in the first application, and voted there. It should be noted that at this polling station her information was also present in the publicly available extract from the Registry. A trusted source from Saratov Region reported that in one of Saratov’s districts the technology of so called “cruise voting” was used with participation of kindergarten personnel and the parents of children. On instructions from their management, the kindergarten teachers approached the parents of some of the kids with a request to collect the application for voting at the place of temporary residence (mechanism 4-0), and then bring it to the kindergarten. Following that, and depending on the kindergarten’s size, a group of trusted staffers (from 2 to 10 people) was given about five special applications with stamps (that were acquired by the parents in their own name) and a map of polling stations, where they had to vote using these applications. At the polling station, kindergarten staff had to approach the secretary of the election commission, provide their passport and application, and then vote. The staff also had to report by phone after successfully passing each polling station. Finally, following the voting at all the specified polling stations, the staff had to return to the kindergarten and receive recompense of one thousand rubles per vote (at each polling station). The most serious violations regarding the procedure of registering the applications for voting at the place of temporary residence revealed in the course of assessment relate to three aspects: 1) the place where applications were registered; 2) the deadline for registering application; 3) the very process of registering application. 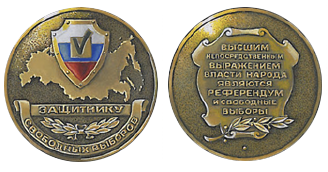 In the Ryazan Region, in the course of assessing the mechanism of repeated submission of application using the 4-0 arrangement, the volunteers discovered that the special application envisioned by this arrangement was documented by the District Election Commission that had no authority to do that. According to item 2.16 of the Procedure, if application is submitted using mechanism 4-0, the voter can submit the special application only at the District Election Commission at the place of permanent registration. 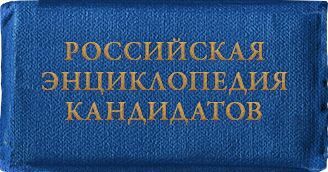 This application, which allows one to vote at any polling station included in the list approved by the decision of the election commission of the Russian Federation constituent, is protected with a special stamp, which serves as the document of rigorous bookkeeping. 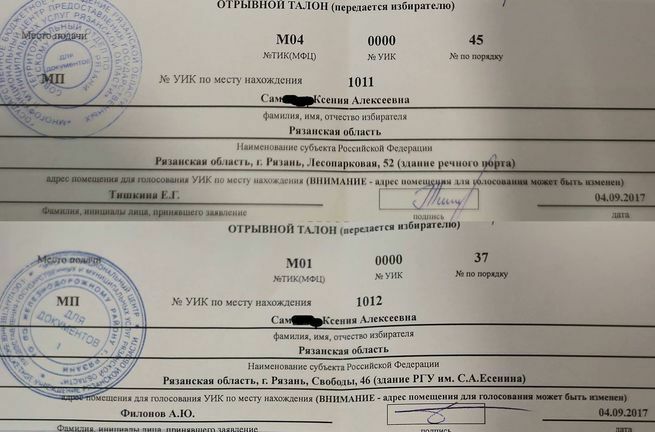 Participant of the assessment submitted his special application at Ryazan’s DEC № 1011, although he wasn’t on the electoral roll of this District Election Commission because he didn’t have a permanent registration at this territory. We believe that such cases discredit the effectiveness of the whole system of recording special applications. The Procedure also clearly specifies the deadline for submission of each type of application. Thus, when submitting application using 45-5 mechanism, the voters had to go to the Multifunctional Center, District Election Commission or Territorial Election Commission at the place of permanent registration or at the place of temporary residence, or they had to submit the application via Gosuslugi e-portal no later than September 4, 2017. 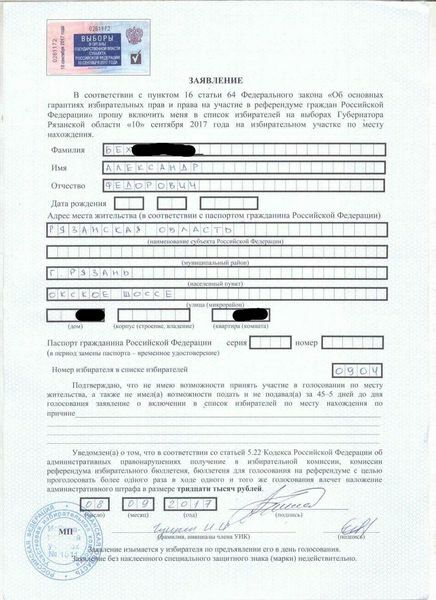 In the course of submitting the application using 45-5 mechanism, a volunteer at the Novgorod Region was able to submit her application at the Gosuslugi portal on September 5, 2017 (appendix 4). The Procedure envisions special measures for assuring transparency and openness in the commissions’ work related to organization of voting at the place of temporary residence. Thus, item 5.3 of the Procedure states the rights of commission members with advisory vote, as well as the rights of observers and media representatives — in particular, the right to study the Registry of voters, as well as the right to receive information about the number of voters who cast their ballots at the place of temporary residence at the specific polling station. A part of the process of assuring openness of commission’s work is the presence at the voting premises of the publicly available Registry of voters who submitted applications for inclusion/removal to/from the electoral roll at the given polling station. The absence of information about voters who decided to cast their ballots at the polling station at the place of temporary residence, as well as about voters who were removed from electoral rolls, creates fundamental difficulties for observers and directly violates the principle of transparency and openness in the work of election commissions. The use of new procedure of voting at the place of temporary residence became one of the mechanisms used by local administrations to mobilize voters and control the voting. It bears reminding that this procedure was introduced primarily for voters who continuously live, study and work in a place different from the place of their permanent registration, and don’t have the opportunity to exercise their voting rights by virtue of distance. It turned out in practice that this mechanism can easily be used to organize controlled voting. First, the voters are forced under various pretexts to submit applications for voting at the place of temporary residence. Then, on the basis of partially depersonalized electoral rolls compiled by the Vybory state automated system for each polling station, various “curators” and “mobilizers” have an opportunity to control participation of these voters in the election, and to organize their transfer to specific polling stations. Ultimately, this mechanism can also be used to control the results of election at a specific polling station. and a number of other polling stations. 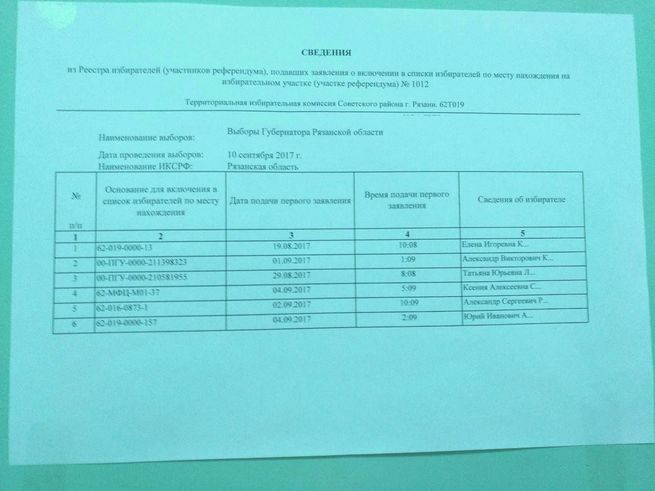 In view of this it bears reminding that back in July of 2017 it was revealed that administration of the Motovilikhinsky District of Perm “as part of preparation for gubernatorial elections” demanded that the heads of educational institutions located in the district submit information about the number of staff members and students, and that they also appoint certain “election coordinators” and “mobilizers” at the schools. It seems that the plan to organize student voting “at the place of study” was ultimately implemented. Among other polling stations with large numbers of voters who wanted to cast their ballots by application, the election commissions of Dzerzhinsky District, located at the Parkovy microdistrict, also stood out. 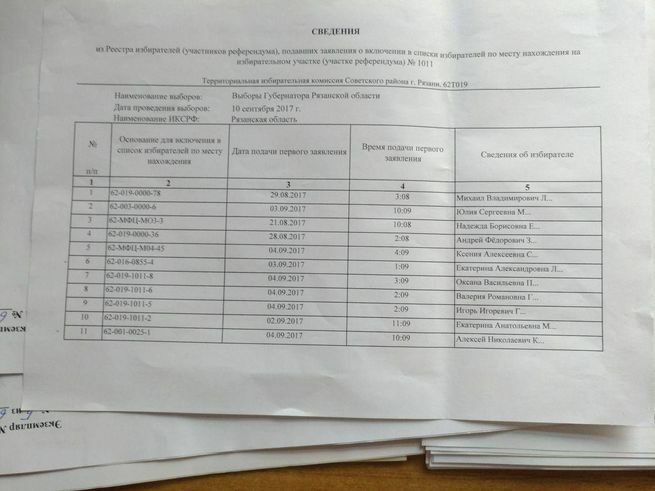 According to the information of the Vybory state automated system, the polling stations located at school № 59 received a large number of such applications: DEC № 2839 received 139 applications, № 2842 — 176 applications, and the so called “special DEC” for voting in accordance with “special applications” № 2841 received 333 applications. At school № 44 where DECs № 2833, 2834, 2836 were located, the number of applications was 152, 202, and 146 respectively. 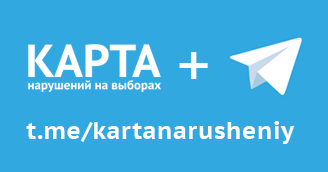 One hundred thirty-five applications were received at gymnasium № 31 at DEC № 2832. On the other hand, Ordzhonikidzevsky District of the city had the greatest number of District Election Commissions with a large number of “removed” voters, i.e. those who submitted applications to vote at another place. To compare, the first DEC from a different district of Perm is in the 91st place among the commissions with the greatest number of applications for removal from electoral rolls. 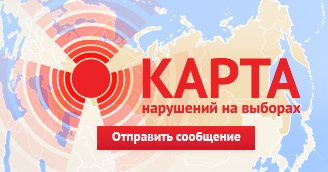 Back in August, the voters reported that the management of Kamkabel enterprise (located at Ordzhonikidzevsky District of Perm) plans to organize the voting of its workers at the polling stations included in the electoral district of Vladimir Plotnikov, the deputy of Perm City Duma, who is believed to own the company. On the election day, public observers and several local journalists recorded delivery of staff and veterans of Kamkabel by “tour” buses to the specified polling stations of the Dzerzhinsky District. As a result, starting in early morning, these polling stations had lines of voters made up of enterprise workers brought specifically to vote. Following the vote, the workers were taken on bus tours of Perm churches. Such actions of the “tour” organizers were also accompanied by bookkeeping and control of voters in specially-compiled lists. 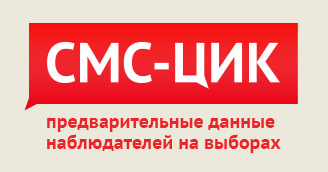 It should also be noted that at 7pm online video broadcasts from the aforementioned polling stations located at school № 59 of Perm’s Dzerzhinsky District were suspended, thus precluding video observation of the vote counting procedure. 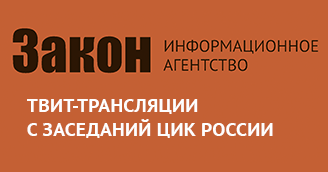 There was also a large number of voter applications to DECs № 2849 and 2850 (Public Center of Komsomolsky microdistrict, which has close ties to AO PZSP) — 224 and 319 applications respectively. Various “curators” and “mobilizers” from enterprises and government institutions kept personal tabs on voters using special “letterforms” (which are at the disposal of public observers), marking on these pieces of paper which voters came to vote and when. 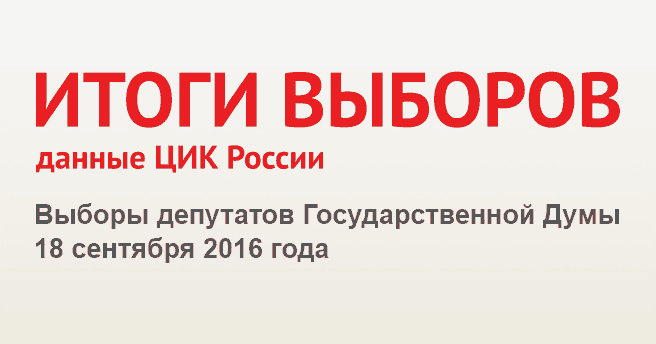 Such generic letterforms were discovered in different electoral districts of Perm and Perm Region. 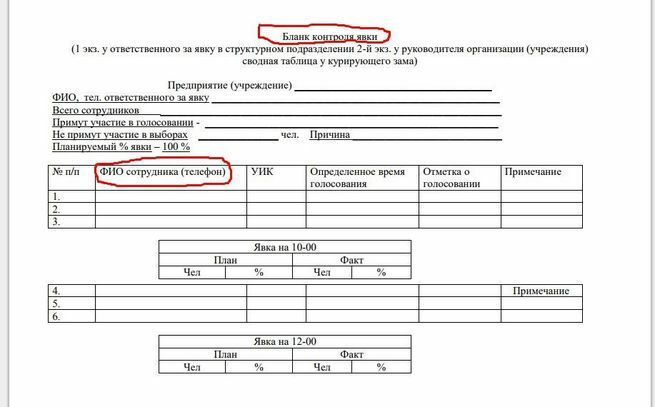 At some of the polling stations, tabs on the voters were kept by observers from United Russia who used the same letterforms (appendix 5). 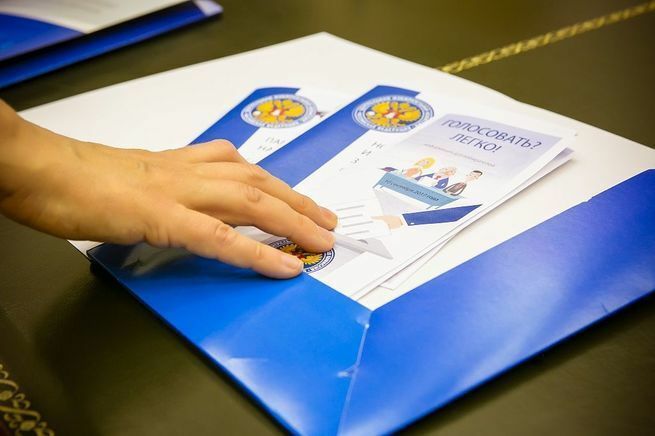 All volunteers of the assessment, except for participants from the Tomsk Region, noted unsatisfactory preparation of election commission members concerning organization of voting at the place of temporary residence..
Due to poor preparation, commission members made mistakes in registering the applications. 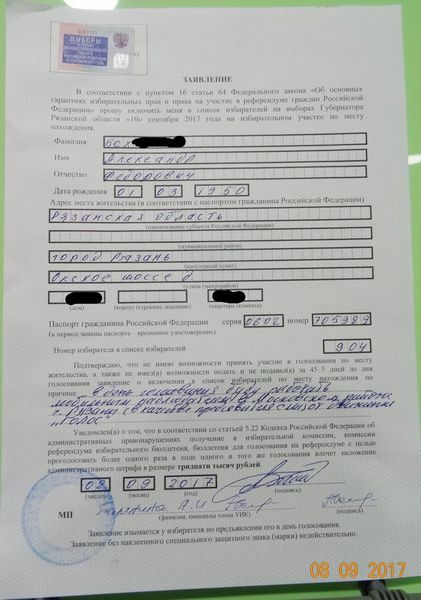 For example, in the Ryazan Region, a member of the District Election Commission № 1011 who was registering the special application, did not register the said application in the Registration Log (item 2.16 of the Procedure) and cut the greater part of the protective stamp before affixing it to the application (appendix 2). 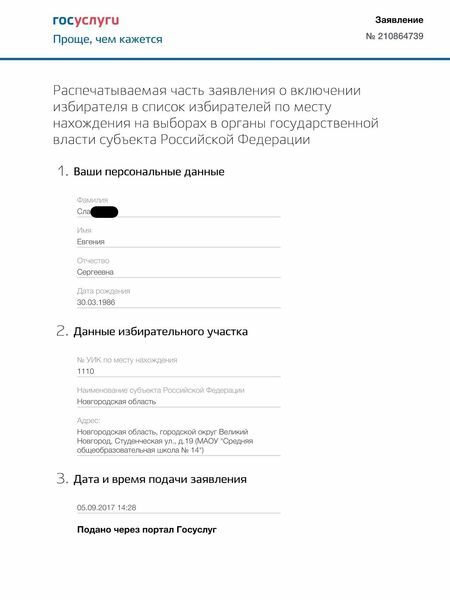 Later the same member of DEC № 1011 visited the volunteer at home and exchanged his application for a new one, filled out in his name, arguing that the first application contained mistakes (appendix 3). In a number of cases the members of district commissions had no idea what the procedure of ballot issue entails. The volunteer who verified the use of 4-0 mechanism in the Krasnodar Region was able to convince the commission that she has a right to vote at the chosen polling station only after lengthy negotiations. According to the volunteer, members of DEC № 2001 simply didn’t know about the procedure and were unfamiliar with the rules of ballot issue. Serious complications were encountered by the volunteers who tested 45-5 mechanism with subsequent voting at the DEC at the place of permanent registration. According to item 3.9 of the Procedure, the voter who submitted an application to vote at the place of temporary residence, but who on the election day wished to vote at the District Election Commission at the place of permanent residence, may be included in the electoral roll after the said district commission verifies his information. Members of DEC № 532 at the city of Saransk (Republic of Mordovia), and DEC № 1211 in the Novgorod Region didn’t know about these rules: participants of the assessment met with great difficulty in attempting to vote at these polling stations. Appendix 8. Publicly available extract from the Registry at the DEC №1011 of the Ryazan Region, which contains information about assessment participant (Ksenia Alexeevna S.) without a special mark. The Registries themselves contain mistakes — the time of application’s submission is replaced with the number of the month. Appendix 9. Publicly available extract from the Registry at the DEC №1012 of the Ryazan Region, which also contains information about assessment participant (Ksenia Alexeevna S.) The time of application submission is also stated incorrectly.